Art and literature are components of ideology. These influence human thinking and control practice. Be it revolution or counter revolution, first it is necessary to create public opinion. The reactionary art and literature create public opinion on behalf of making counter-revolution and sustaining counter-revolutionary power. The literature and culture of reactionary content with high standard artistic form is the most dangerous. Rabindra literature is proof of that. In East Bengal, correct from the proletarian outlook, high standard artistic formed national democratic art-culture (anti Expansionism, Social Imperialism, Imperialism, Bureaucratic Capitalism and feudalism art and culture) have not developed. When making such art-culture, we should not merely put forward class struggle because it is acceptable to bourgeoisie even big bourgeoisie. The dictatorship of proletariat the inevitable end of class struggle (at present people’s democratic dictatorship), the necessity of political party of proletariat to establish that, its led armed and other struggles and the scientific theoretical basis of proletarian class struggle the Marxism-Leninism-Mao Tse-tung Thought and its application-practice must reflect in art-literature-culture. Only then, content of such type of art & culture will be considered correct from the proletarian outlook. Thus, we have to overcome the limitations of Sukanta. Literature-culture should not only be correct in terms of content but also contain such artistic form that is acceptable and appreciated by mass cadres, soldiers, sympathizers, supporters and people. Thus, we have to overcome the limitations of modern literature-poetry-art. Art-literature-culture with unity of revolutionary content and high standard artistic form (accepted and appreciated by people) will create ideological preparation for revolution of East Bengal, create public opinion on behalf of revolution and encourage people in revolutionary work. Our fraternal comrades of China-Indonesia-India and other countries are examining with revolutionary art-culture. We are to examine in East Bengal too because we do not have any predecessor in Bengali literature to show us correct path. Therefore, there can be weakness in our content and form of art, but we shall emphasize on content, that is politics, while perfect artistic form will develop in the course of practice. We have to analyze domestic and foreign art and literature of past and present, creatively learn from those, of course, not blindly. Such art-literature will be considered fruitful which is on the one hand correct from the proletarian outlook, on the other which will be accepted by our cadres, guerrillas, sympathizers, supporters and people and from which they get inspiration for revolution. So, successful application of spirit of serving people in art-literature will be to produce such art-culture which is correct from proletarian outlook, acceptable to people and inspiring. 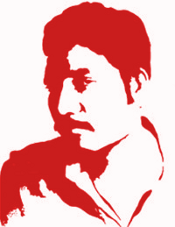 As the Proletarian Party of East Bengal produced new history of revolutionary work, new style of writing revolutionary articles, so it has taken historic step of developing completely new path of art-literature that is genuine revolutionary in content and perfect form of art which is appreciated by people.